Harrold-Odell Country Park - Ice and Water Trail at HarroldWalking RouteFollow this short but pretty walk to discover how ice and water made the landscape of the Country Park you see today. Harrold-Odell Country Park can be reached by following the signs to Harrold from the A428 ( Bedford to Northampton road ) or A6 (Bedford to Rushden road). Start Description The walk starts and finishes at the Main Car Park next to the Visitor's Centre. 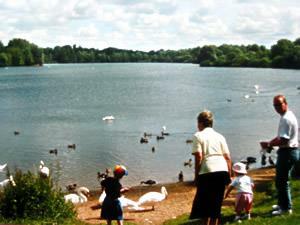 Follow this short but pretty walk to discover how ice and water made the landscape of the Country Park you see today.